Technology has come a long way from adding machines, mainframe systems, Computers that take up 500sq ft. off office space using 12″floppy disks to a highly technology advanced infrastructure using 10TB Hard drives. 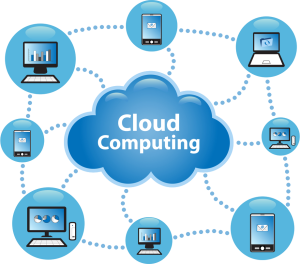 I question weather or not cloud computing is the solution for every company. Cloud computing helps for redundancy and offsite data however security is a major key in keeping company data safe. Perhaps the biggest concerns about cloud computing are security and privacy. The idea of handing over important data to another company worries some people. Corporate executives might hesitate to take advantage of a cloud computing system because they can’t keep their company’s information under lock and key. The counterargument to this position is that the companies offering cloud computing services live and die by their reputations. It benefits these companies to have reliable security measures in place. Otherwise, the service would lose all its clients. It’s in their interest to employ the most advanced techniques to protect their clients’ data. Some questions regarding cloud computing are more philosophical. Does the user or company subscribing to the cloud computing service own the data? Does the cloud computing system, which provides the actual storage space, own it? Is it possible for a cloud computing company to deny a client access to that client’s data? Several companies, law firms and universities are debating these and other questions about the nature of cloud computing. How will cloud computing affect other industries? There’s a growing concern in the IT industry about how cloud computing could impact the business of computer maintenance and repair. If companies switch to using streamlined computer systems, they’ll have fewer IT needs. Some industry experts believe that the need for IT jobs will migrate to the back end of the cloud computing system.